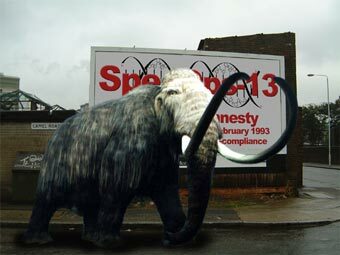 The recent mapping of the annual migration route shows that Devizes continues to serve as a route meeting point, causing the usual chaos on the streets as mammoths roam through town. 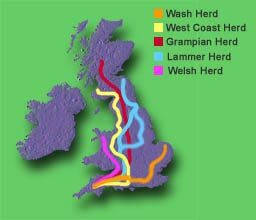 As you can see from the map the Welsh Herd have been succesfully re-routed via the Roman Bath road and through the Mendip Hills. 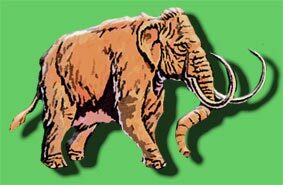 This was acheived through strategic placing of mammoth gates and mammoth grids on vital roads. Attempts to lure the West Coast, Lammer, Grampian and Wash herd onto alternative paths have however failed. 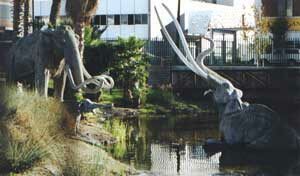 Although at first it appeared that the Wash Herd might have been tempted south when they altered from their traditional course and headed over the newly built Thames Proboscidea crossing at Greenwich, hopes were dashed when they made a later forage north at Godalming thus joining the Grampian and Lammer Herds just outside of Devizes. Locals continue to protest and insurance remains high. Apart from the annual uproar in Devizes, new protests have arisen from the National Parkland Protection and Sunday Walkers Association. 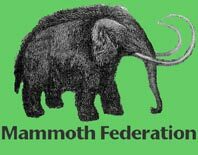 It is claimed that the national migration routes of mammoth risk erroding and destroying delicate parklands and sites of special scientific interest - Furthermore the Sunday Walkers Association claim that their safety is at risk from wandering individuals and unprecedented herd movements. Click HERE for more information.